This is one of my very favorite things. You must try this recipe - you won't even believe how good it is. I know - it sounds a little odd. And I don't even like cooked carrots - but I LOVE this dip. I could just stand and eat it with a spoon. This is from an excellent cookbook called "Veganomicon: The Ultimate Vegan Cookbook" - buy yourself a copy, you won't regret it. I am not a vegan - this is just a great cookbook. This dip is great on crackers, or to dip vegetables in, or in a sandwich, or on a pita, or a tortilla - and I especially love it on really good sourdough bread, something about the combination of the sour bread with the flavors in this dip just pair really well. Below is the recipe as printed in the book. I probably sound like a broken record by now - but you know I don't follow recipes very well - my variations and notes are below the recipe. Bring a small pot of water to a boil. Boil the carrots for 7 to 10 minutes, until soft. Drain and let cool just until they are no longer steaming. Place the sunflower seeds in a blender or food processor and process into crumbs. 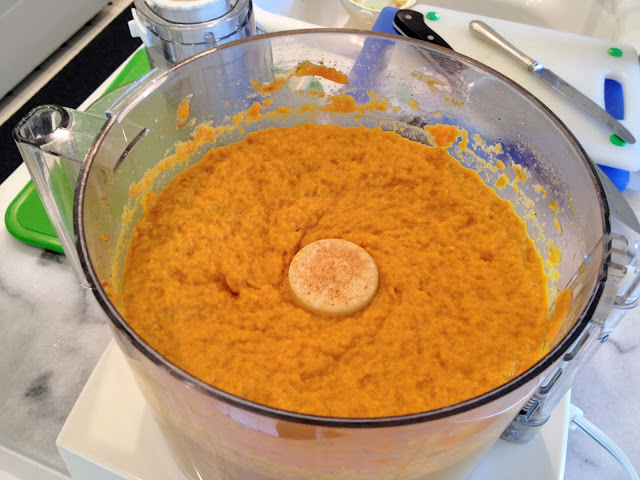 Add all remaining ingredients and blend until smooth, scraping the sides of the processor as you go. Taste for salt and adjust the spices and lemon. Transfer to a covered container and refrigerate at least 30 minutes. I've made this enough times now that I don't bother measuring and I just approximate the amounts. The first time I had this our nanny made it for us, and we had everything necessary in the house except for sunflower seeds. But we had sunflower seed butter, so she substituted that in the recipe, and I've just done it that way ever since. It saves a bit of time too, since you don't have to blend the sunflower seeds. And - this most recent time I was out of the sunbutter, so I used peanut butter instead, and that turned out great too. If you go this route, just use a little less oil. I also add a lot more lemon juice than the recipe calls for, and more salt (although if you're used a salted sunbutter or peanut butter, you'll want to taste the dip before you add too much salt). And it's worth noting that the flavor will really vary depending on your curry powder. I don't want this to be spicy - so I tend to use a very mild curry powder, and just add more than the recipe calls for to up the flavor without making it spicy. This stuff is so good it's easy to stand in the kitchen and eat the warm dip out of the processor with a spoon, it's creamy and light and tangy and flavorful. But if you have the patience to wait, it's even better the next day after chilling in the fridge. This recipe is also really great (and dare I say maybe even better) with cauliflower or roasted squash instead of carrots. Give it a try. And here is perhaps my most favorite way to eat this - spread on leftover injira - Ethiopian flat bread. This has a great sour flavor like sourdough bread, but it's thin and light and spongy. I tried making this once and it was very unsuccessful - so instead I just get extra when we have Ethiopian takeout.